Science of the Saints, 4-I-2019 (22 Dec.) The Holy Great Martyr Anastasia. The Great Martyr Anastasia the Alleviatrix-of-Captives, a Roman by birth, suffered for Christ during the time of the persecution against Christians under Diocletian. Her father was a pagan, her mother was secretly a Christian. 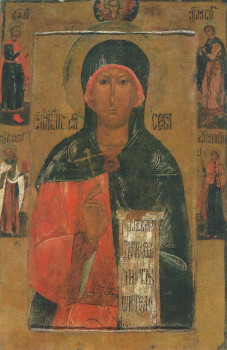 The teacher of Saint Anastasia in her youth was an educated and pious Christian named Chrisogenes. After the death of her mother, her father gave Saint Anastasia in marriage to a pagan named Pomplius, but under the pretext of a contrived illness, she preserved her virginity. Clothing herself in the garb of a beggar, and accompanied by only one servant, she visited the prisons: she fed, doctored, and often ransomed captives that were suffering for their faith in Christ. When her servant told Pomplius about everything, he subjected his wife to a beating and locked her up at home. Saint Anastasia then began secretly to correspond with Chrisogenes, who bid the saint to be patient, to conform all thoughts to the Cross of Christ and prepare herself to serve the Lord; he foretold also the impending perishing of Pomplius in the sea. And after a certain while Pomplius did indeed drown, having set out with a delegation to Persia. After the death of her husband, Saint Anastasia began generously to distribute her property to the poor and suffering. The emperor personally interrogated Chrisogenes, but being unable to incline him to a renunciation of faith, the emperor then gave command for him to be beheaded and thrown into the sea. The body and severed head of the holy martyr were carried by the waves to shore. There by a Divine prompting they were found by a certain presbyter named Zoilus who, having put them within a coffin, concealed them at his home. Chrisogenes appeared to Zoilus and informed him that martyrdom was near for Agapia, Chiona, and Irene – youthful Christians living not far away – and bid him to send Saint Anastasia to them. For Zoilus himself, Chrisogenes foretold a quick and peaceful death. Chrisogenes likewise in a vision guided Saint Anastasia’s path to Zoilus. Having come to the presbyter, she prayed at the relics of Saint Chrisogenes, and afterwards she spiritually strengthened the three maidens before their tortures. When these three martyrs gave up their souls to the Lord, she herself buried them. Having carried out the bequest of her teacher, the saint began her wanderings. And having gained proficiency in the medical arts of the time, she zealously cared for captives far and wide. Through her exploits, Saint Anastasia earned for herself the name Alleviatrix-of-Captives, since by her many efforts she delivered from agony of long-time suffering many a confessor of the Name of Christ. One time she made the acquaintance of the pious young widow Theodotia and found in her a faithful helper. Both soon suffered persecution. They arrested Saint Anastasia when she was in Illyria. This occurred just after all the Christian captives there had been murdered in a single night by order of Diocletian. Saint Anastasia had come to one of the prisons, and finding no one there, she began to weep loudly. The jailers realised that she was a Christian and led her off to the governor of the district, who tried to persuade the saint to recant Christ by threatening torture. He then handed her over to the Capitolian pagan priest Ulpian. The cunning pagan offered Saint Anastasia the choice between luxury and riches, or grievous sufferings. He set before her on the one side gold, precious stones, and clothing, but on the other side – fearsome tools of torture. The pagan guile was put to shame by the bride of Christ – Saint Anastasia refused the riches and chose the tools of torture. But the Lord prolonged the course of the earthly deeds of the saint. Charmed by the beauty of Anastasia, the pagan-priest decided to profane her purity, but during his first yearnings to touch her he suddenly became blind. Losing his wits under this affliction, he dashed to run off to a pagan temple to appeal to the idols for help, but along the way he fell down and died. Saint Anastasia was set free and together with Theodotia she again devoted herself to the care of imprisoned Christians. Before long, Saint Theodotia and her three sons accepted a martyr’s death. Her eldest son, Evodus, stood bravely before the judge and without protest endured beatings. After lengthy torture, they threw all of them into a red-hot oven. Saint Anastasia was caught again and condemned to death by starvation. She stayed in prison without food for sixty days. Saint Theodotia appeared to the martyr every night and gave her courage. Having seen that hunger caused Saint Anastasia no harm whatsoever, the judge sentenced her to drowning together with condemned criminals. Among these people also was Eutykhian, condemned for his Christian faith. When the ship went out into the open sea, the soldiers bored holes in it and transferred themselves into a boat. Saint Theodotia appeared to the captives and commanded the ship to shore. Having come to dry land and being saved by the miracle, the 120 men believed in Christ and were baptised by Saints Anastasia and Eutykhian. All were soon captured and given over to a martyr’s death. They stretched Saint Anastasia between four posts cross-shaped over a red-hot bon-fire. A certain pious woman Apollinaria buried in a garden her body, unharmed by the fire. In the fifth century the relics of Saint Anastasia were transferred to Constantinople, where a church in her name was built. They later transferred the head and an hand of the Great Martyress to the monastery of Saint Anastasia Uzoreshitel’nitsa (Alleviatrix-of-Captives), located near holy Mount Athos. Previous Previous post: Science of the Saints, 3-I-2019 (21 Dec.) The Holy Martyress Juliania of Nicomedia. Next Next post: Science of the Saints, 5-I-2019 (23 Dec.) The Holy Ten Martyrs of Crete.